A decade later, Dwyane Wade continues to dupe opponents with his "go-to" move. MIAMI -- As the saying goes, you can't teach an old dog new tricks. But when it comes to Dwyane Wade's defenders, you apparently can't teach a young dog old tricks either. Wade's old trick is the pump fake on a jump shot, and he's been fooling young defenders with it for more than a decade now. During Wednesday night's win over Toronto, three separate defenders fell victim to Wade's signature move, and it may have even cost the Raptors the game. Here's how it typically goes down: Wade attacks from the perimeter, abruptly picks up his dribble around the 3-point line and slowly rises as if he's going to take a long jumper. But before he leaves the ground, Wade hits the pause button on his shooting motion. And seemingly without fail, his defender bites on the pump fake and launches into Wade's space, prompting Wade to restart his shooting motion right into the helpless airborne defender. On Wednesday, the gullible few were Amir Johnson, DeMar DeRozan and Landry Fields -- all age 25 or younger -- and the turning point of the tightly fought game may have been when he got Johnson to bite. And Johnson bit hard. Down 112-109 in overtime, Wade ran a side pick-and-roll with Chris Bosh, and Bosh's defender (Johnson) switched onto Wade. Seeing the mismatch on the foul-prone big man, Wade pulled up behind the 3-point line and waited for Johnson to try to block the shot. Sure enough, Johnson left his feet to contest a jumper on the shorter player -- a cardinal sin in coaching circles -- and Wade got him with the pump fake. When the whistle blew, Toronto head coach Dwane Casey immediately threw up his hands and turned away in disgust, then paced back and forth on the sideline. Three free throws for Wade, and the Heat ran away with the game from there, outscoring the Raptors 14-4 the rest of the way. Casey wasn't the only one who couldn't believe another one of his players fell victim to Wade's ploy. After Johnson's foul, TNT analyst Steve Kerr, one of the NBA's greatest 3-point shooters ever, took to Twitter. I think the NBA should fine any player who jumps at D Wade's pump fake at the 3 point line. He's been doing it forever!! Scouting report??? After the game, Kerr's tweet was shown to Wade in the locker room, sending the eight-time All-Star into a fit of laughter. "Wait, Steve Kerr said that?" Wade asked, smiling ear to ear. "That is hilarious." As Kerr points out, Wade's been doing this for years, but it only seems to work against young players. 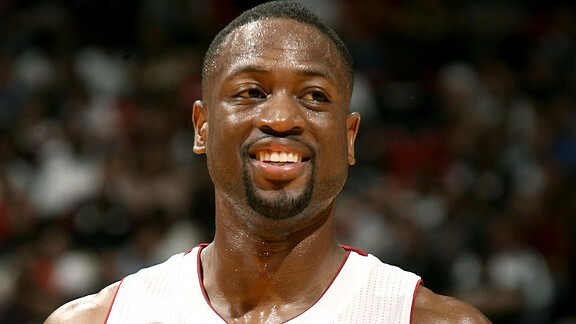 Darius Morris, 22, fell for Wade's trap in Miami's previous game against the Lakers last week. The game before that in Golden State, Wade earned an and-1 opportunity with it against another 22-year-old, this time Klay Thompson. He lured both DeMarcus Cousins (22) and Marcus Thornton (25) with it recently as well. But Wade didn't come up with the pump fake on his own. He readily admits that he picked it up in college from Sam Cassell, a former All-Star point guard and a current Washington Wizards assistant coach. When Wade played at Marquette, he'd watch Cassell play for the nearby Milwaukee Bucks. The first time Wade saw Cassell use a pump fake on a jump shot, Wade was immediately hooked. "I was like, 'Ooh, I like that,'" Wade recalled. Rest assured, Cassell won't let Wade forget where he got it. "Every time we play Washington," Wade laughed, "Sam Cassell gives me an earful because I stole it from him." We know it's effective, but why is it so effective? Wade will never be mistaken for Kerr as a jump shooter, or Cassell for that matter. But defenders continue to frantically try to block the shot anyway. Wade is a career 29.3 percent 3-point shooter, which means that he'll score about 0.9 points on average if he takes the 3-pointer, contested or not. But if Wade -- a career 76.9 percent free throw shooter -- is fouled beyond the arc, it's a 2.3-point play because he gets three freebies at the charity stripe. Statistically, the upside of blocking the shot just isn't nearly worth the risk, but players continue to make that gamble. And more often than not, they lose. Moreover, there seems to be a psychological game at play here, too. “Sometimes you hear coaches yelling, 'Watch the pump fake! Watch the pump fake!'" Wade said. "And I love when they do that. Because now they’re thinking about it." Shane Battier has seen Wade do it from both sides, as an opponent and a teammate. He agrees that Wade is using psychological warfare against his younger -- and mostly taller -- foes. "You can say 'Don’t jump at it,' but it’s tougher to talk about than to do since it’s one of the best shot fakes," Battier said. "And when Dwyane starts going and scoring, a lot of guys get nervous and they don’t want to look bad that they can’t guard him, so they want to block him so badly. That’s why it’s so effective." As a veteran, Battier would like to think he wouldn't fall for it, but he knows the pride that comes with swatting the shot of a player of Wade's caliber. You know who's never bitten on Wade's pump fake? LeBron James. Or so he says. When asked about it after Wednesday's win, James referred to it as Wade's "go-to" move. But he claims he's never fallen for Wade's tricks. "It never worked on me when I went against him, though," James said. "I knew he was going to go to it, but it never worked on me." Every once in a while, Wade gets a taste of his own medicine. An opponent will pull up short on the perimeter and Wade will lunge into the shot, hoping to swat it away. Wade acknowledges that he's vulnerable to others using his own weapon against him.